Large Summer House - Who Has The Best? A large summer house can transform not only the garden but the property as a whole, adding value in more ways than one. That means that whilst they aren’t among the cheapest garden buildings we review, they can still provide exceptional value for money. With their size comes versatility, as they can be used for everything from a garden based office, to a guest room or simply a spacious area in which to relax on a sunny day. 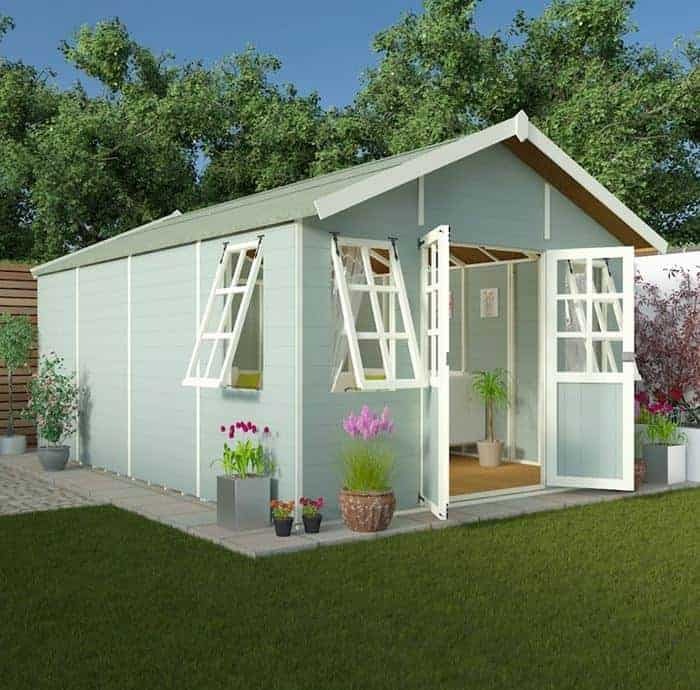 To help you find the model that’s just right for you, WhatShed have created this handy guide to the best large summer houses that are available online in the UK. As a definition for league table purposes, we’ve ruled out log cabins and only considered summer houses that have a base area in excess of ten foot by ten foot. Nevertheless we are pleased to have found fifteen very high quality models, with a range or prices to suit most budgets. Value for money has been a major factor in determining the final positions within the league table, but we’ve also looked at design and aesthetic appeal, build quality, and value adding factors such as extended warranties. This has proved to be a very competitive category of garden building, with a diverse range of models involved, so choosing an ultimate winner from such a high quality fifteen was a difficult task. 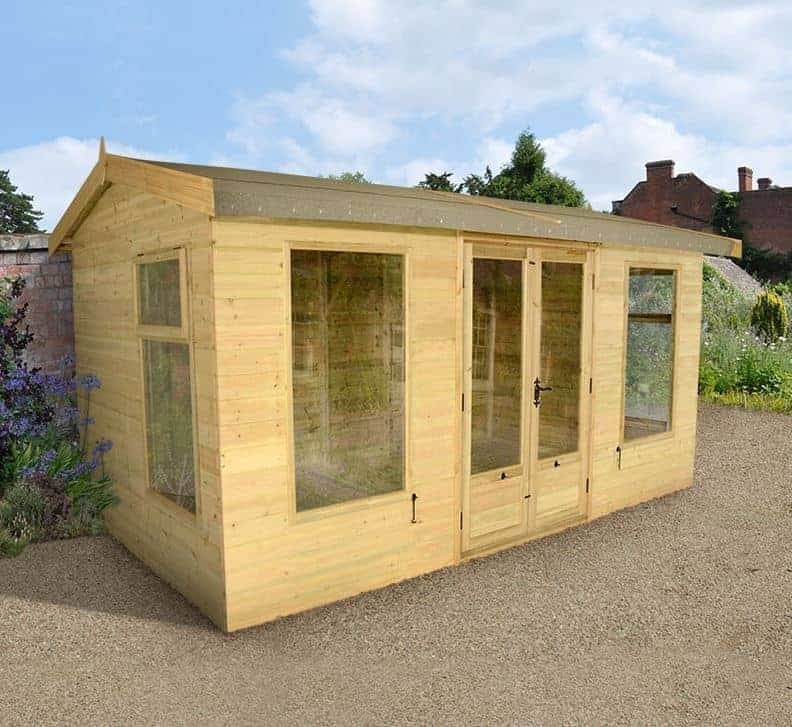 Congratulations then to the fourteen foot by ten foot Champion Harvington summer house, which thanks to its classic design, tough build, long warranty period, and relative value for money is named the best large summer house that can be bought online in the UK today. 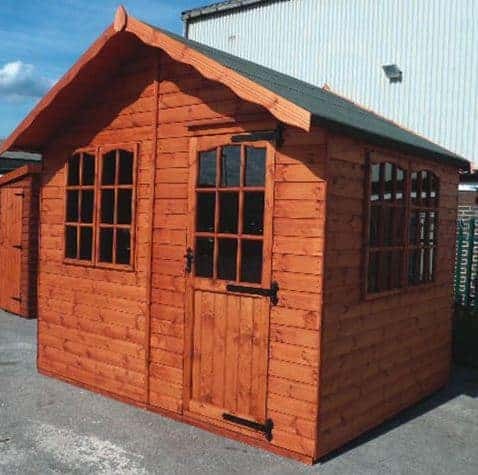 Whether you want summer houses or timber sheds, WhatShed will bring you the reviews that answer your questions and help you make a great purchasing choice. 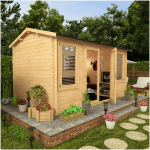 A high quality large summer house will typically cost more than most other garden buildings that we review, and yet they can also do more to beautify the garden and add value to a property. That’s why even though this particular Harvington summer house has an asking price in excess of three thousand pounds it’s far from the most expensive to feature in our league table, and we still feel it represents good value for money. It’s also one of the most attractive examples that we’ve seen, with a large amount of glass catching the eye across the front of its reverse apex design, and one of the toughest and most durable. The combination of these factors mean that we have no hesitation in naming this the number one large summer house available to buy online in the UK today. The larger a building is, the more important it is for it to be strong and stable so that it doesn’t become adversely affected by strong winds. That’s why we were pleased to find that the tongue and groove cladding used throughout this fourteen foot by ten foot shed was supported by a thicker than average frame size of 32 x 57mm. We were also pleased to find that the timbers had been pressure treated, and that they therefore came with the reassurance of a 15 year warranty period. 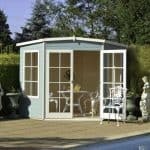 With toughened glass used in the four windows and glazed panels on the double doors as well, this is a strong and reliable large summer house. 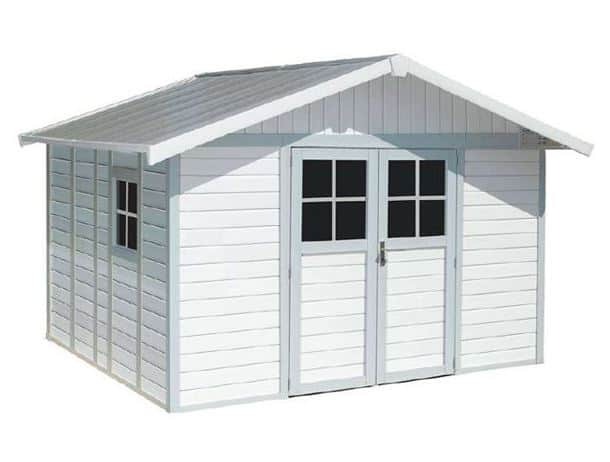 This may not be as elegant as some of the summer houses to feature in this top fifteen league table, and it isn’t as durable as some or protected by as long lasting a warranty, but it is the biggest large summer house to feature here, as well as being one of the cheapest. It’s this excellent value that takes it into the runner up position within our league table, and yet that isn’t the only thing that we found impressive. The wide frontage features double hinged doors in the very centre, with two windows on either side of the doors and a further window on each side. This not only results in a light and airy interior, which is always something we welcome with a large summer house, it also creates a very symmetrical appearance that we found very attractive. 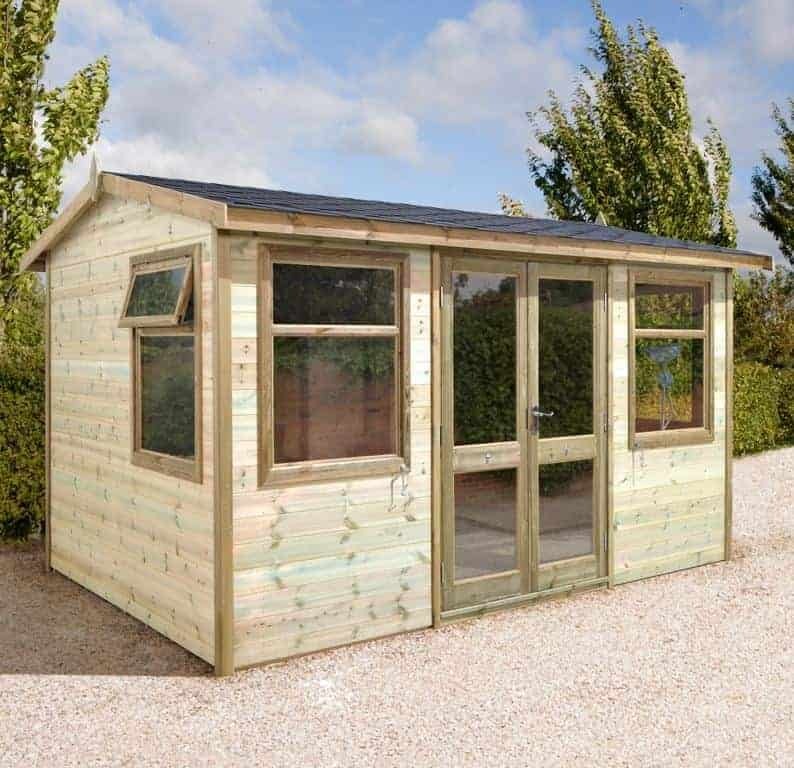 With dimensions of 5.90 x 3.14m, and a ridge height of 2.48, there’s lots of room inside making this an ideal place to use as a home office or extension. We can easily imagine this being transformed into guest quarters, or maybe a spa or gymnasium. We would have liked to see an extended warranty of longer than 10 years offered however, but that doesn’t detract from its great value. This is the second BillyOh large summer house to find a place within our league table, and the fact that this also makes the top three is testament primarily to how good value for money they provide. This Lucia model also shares approximate dimensions of twenty foot by ten foot, although on this case the vertical space is a little more restricted with the apex roof reaching a peak height of 2.23m. There’s also a lot less glazing on display, with only the front section of the summer house being glazed. This creates a very attractive frontage, and yet it also means that anything positioned at the rear of the summer house may be difficult to see for passers by, which in itself can be a boost to security. 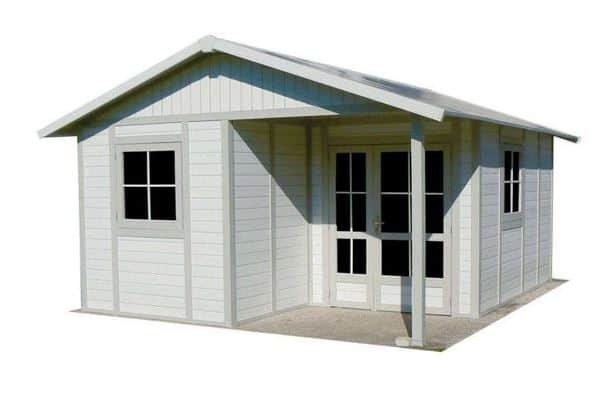 One feature that the Lucia and Eden summer houses do share in common with many of the other BillyOh range of garden buildings that we’ve reviewed, is that they don’t come with any floor as standard. 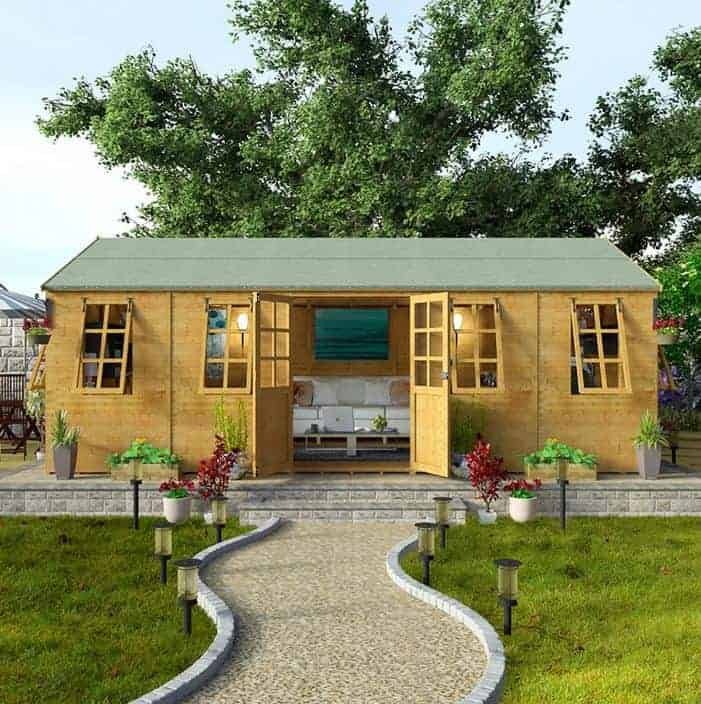 To add a floor will cost up to two hundred pounds, but even so we feel this is the best value summer house of this size that we’ve seen. 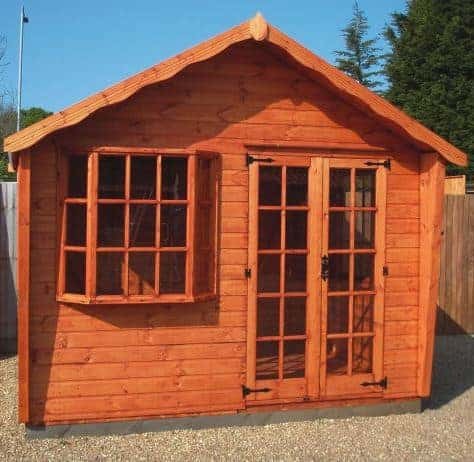 It’s an ideal choice then for those looking for a large summer house on a relatively small budget, even though the warranty provided only runs for five years. Most of the buildings in this league table are made of timber, and have a traditional look that many people love. This large summer house from Grossfillex, however, is a radical departure in looks and build, as it’s made from thick PVC cladding instead. If this conjures up images of bland all white and featureless sheds, however, think again, as this has a design that caught our eye for all the right reasons. Its pastel blue and white colour scheme may not be to everyone’s taste, but it creates a very stylish and contemporary look that we really liked, and we also welcomed the inclusion of four square windows to allow natural light to reach the interior. The cladding of 26mm is significantly thicker than we often see on plastic garden buildings, so that this large summer house should feel just as stable and reliable once erected as wooden ones. The plastic substrate also brings many advantages over timber, as it can’t rot or be eaten by insects or rodents. For these reasons, we would expect it to last much longer than the 10 year warranty provided by Grosfillex suggests, so that even at a little over two thousand pounds for a twelve foot by ten foot building, we still feel this still represents decent value for money. 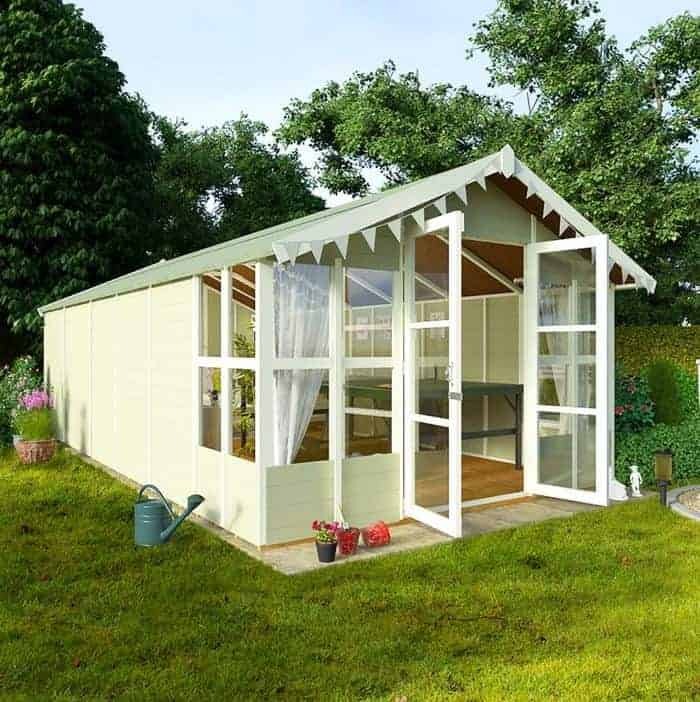 With a base area of approximately eleven feet by ten feet this is the smallest large summer house to make it into our top fifteen list, but there’s still more than enough room to move around in so this could be used for either storage, work, or leisure purposes. This is also the only summer house here to feature a hexagonal design, which also gives it a look of its very own and one that we found very attractive. This can not only function as a very useful garden building, it could also become a talked about garden feature on its own merits. One reason that we found this large summer house so pleasing to look at is that it has a six sided roof covered in black shingles. It not only does an excellent job of carrying rainwater away, it really catches the eye and creates a luxurious and stylish look. It’s also one of the tallest roofs that we’ve seen on large timber summer houses, peaking at 2.90m, and it will likely feel more spacious inside than you might at first think. We were also pleased to see that high quality tongue and groove cladding had been used throughout, and that it had been given an initial pressure treatment which brings with it a 15 year guarantee against wet rot. This is the second PVC clad large summer house to feature in the upper half of our league table, and this is larger and in our opinion even more attractive than the first one. It is also, however, almost twice as expensive which accounts for their relative positionings. If you have a budget that stretches to over four thousand pounds, and you want a spacious summer house that looks strikingly modern then this could be exactly what you’re looking for. With a footprint of 4.03 x 4.93m there’s more than enough room inside for most purposes, but on this occasion it’s been designed in an L shape around a classic chalet style. It’s something that we rarely see in the summer houses we review, and it’s certainly eye catching. It also means that this particular large summer house could easily be used for more than one purpose, with the addition of some interior walls or divides. We were pleased to find however that it retained the use of 26mm thick PVC cladding, and once again it comes with a 10 year warranty that is reassuring even though we feel it could have been extended even further. It should also be quick and easy to assemble despite its large size. 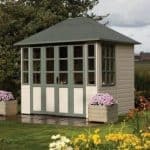 This fourteen foot by ten foot large summer house has a lot to live up to with its ultimate nomenclature, but it certainly scored highly in all of the criteria that we look for in a great garden building. It looks stylish, and is made from high quality components that are not only built to last they’re guaranteed to last, as the 15 year warranty provided by the manufacturer shows. It’s only the fact that it’s also the joint most expensive summer house within our league table that stops it from achieving a much higher ranking. This large summer house is also available in a fully glazed option, but we were already impressed by the amount of glass used on this model. We were pleased to see as well that toughened glass had been used, meaning that you won’t have to worry about accidental damage if you have children or grandchildren playing ball games outside, or the glass being shattered as part of a break in attempt. Security is further boosted by the inclusion of a three lever key operated mortice lock, not something that we always find even on top of the range garden buildings. 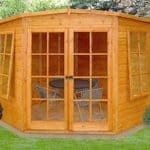 This makes it ideal for people who plan to keep furniture or valuable items inside their summer house. This is closely related to the apex roofed ultimate summer house we’ve just looked at, sharing approximate base dimensions of fourteen foot by ten foot, as well as a matching asking price of just over four thousand pounds which is once again the only reason that this very useful and well constructed large summer house finds itself in mid table rather than in the upper reaches. This has a markedly different look however, thanks to the use of even more glass and a pent roof, which is why it earns a place of its own in our league table. This is the only timber pent roofed large summer house in our top fifteen, and yet it shouldn’t mean that it feels cramped inside. That’s because the pent roof is among the tallest that we’ve ever seen, with a maximum height of 2.49m. A pent roof also creates a very traditional look that we really liked, and it goes well with the profusion of toughened glass underneath it. The fully glazed frontage, and opening windows at the side that can prove very handy for ventilation purposes, make this ideal not only for people who want a lot of natural light to work by, but also for those who want a spot in their garden that’s dedicated to leisure and relaxation. With a 15 year warranty included as well, the owner won’t even have to worry about having to treat the wood in future years. This is possibly the most attractive large summer house that we’ve seen within the extensive BillyOh range thanks to its high quality smooth planed timbers, wide opening double doors, and four opening windows that have been finished in a decorative Georgian style. It also represents exceptional value for money, allowing a well crafted sixteen foot by ten foot summer house to be bought for under eleven hundred pounds. Unlike the other BillyOh summer houses featured in this league table, however, it doesn’t come with an extended warranty of any kind which is why it finds itself significantly lower down our list. Extra thick framing has been used, which is something that we always like to see as it makes this large summer house suitable for use in open and exposed areas that can sometimes be subjected to heavy winds. We were also pleased to find that high quality tongue and groove cladding had been used for the walls and the roof, rather than more cost effective solid sheet material being used as we sometimes see with the summer houses and sheds we review. Once again you’ll need to pay a little extra to add a floor to this large summer house, but that shouldn’t put you off what is a very well priced and attractive building. One of the advantages of having a high quality and large summer house such as this is that they are incredibly versatile. 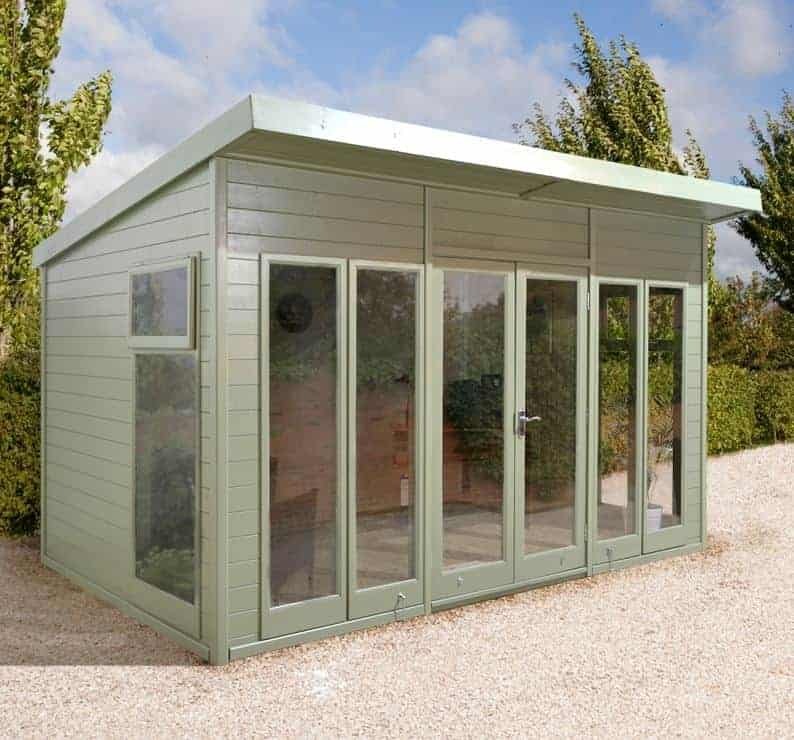 With the abundance of glazing meaning that lots of natural light reaches the interior, we feel this would be a perfect garden office for those who work from home, although blinds would need to be added as well. 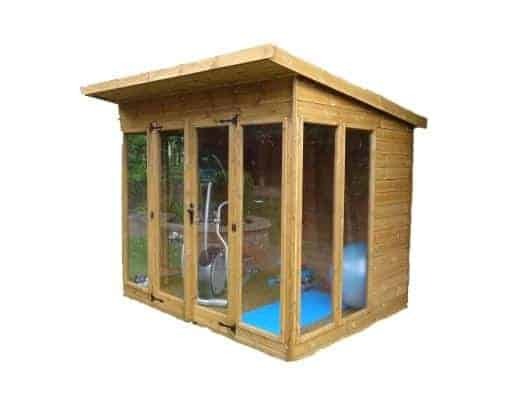 The manufacturer also points out that this is a great garden building to use as a gym, and the wide opening double doors mean that it’s easy to move your favourite gym equipment in and out however big or bulky it is. Acrylic safety glazing has been used for the six windows as well as the fully glazed doors. This isn’t as clear or strong as the toughened glass that we always prefer to see, but it is still shatter resistant and it’s also very cost effective. This cost saving has been passed on to the customer, and it’s the value for money this brings that helps this large shed gain a place within our league table. We were also very impressed by the use of a 44 x 70mm frame, which is a strong and thick as we’ve seen used on any wooden garden building. With so much to recommend it, we can almost overlook the lack of an extended warranty. 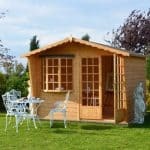 This is a very decorative and yet very traditional large summer house, and we feel it will enhance just about any garden. Even when supplied in its natural wood state, with a slightly honey like hue because of an initial preservative dip treatment, it looks very attractive, but this effect should be multiplied when it has been painted or stained. 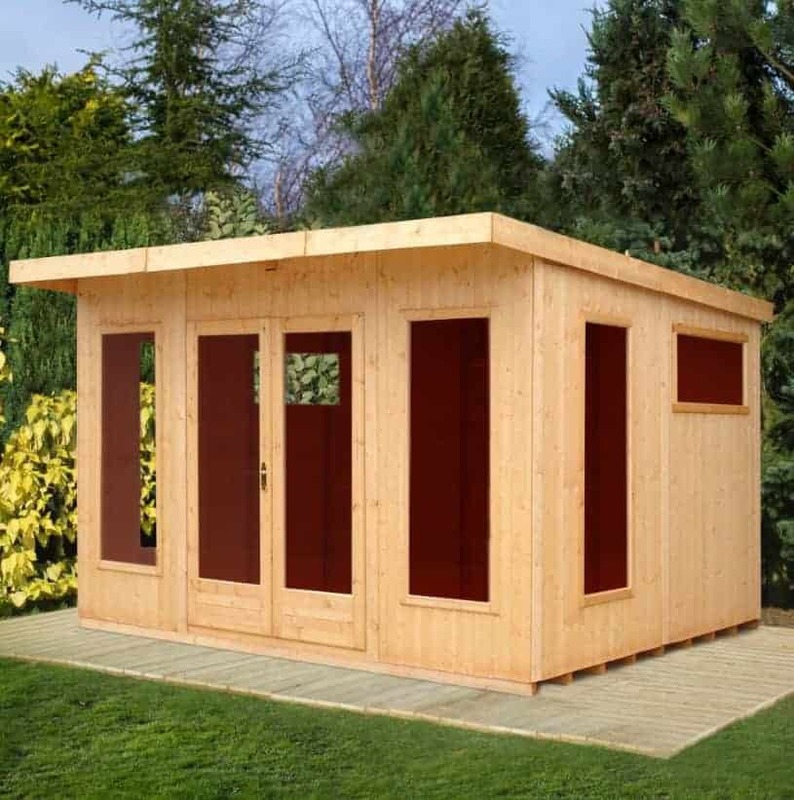 We also recommend that this is carried out for all bare wood garden buildings, as it helps to keep the harmful effects of UV light away from the wood. The owner will also have to add further preservative treatments on a yearly basis, as this summer house comes without any extended warranty period. It’s this that accounts for a position outside the top ten for what is one of the most stylish summer houses we’ve reviewed. The chalet style design really caught our eye, especially as the overhanging roof and side panels extend from the base area. We also liked the fact that all four windows could be opened so that the interior of this large summer house can feel refreshingly airy on a hot day, and the doors too are fully glazed. The things we liked most about the double doors however, apart from the secure key operated lock which is something we always welcome, was the use of black iron hinges and fittings. It’s a little touch that makes a big impression. We have here another large summer house that could function perfectly as a sun room or as a home gymnasium. That’s because it was the glazing that caught our eye from the first moment we saw it. There are four full length top to toe glazed panels that take up the whole of the frontage of this twelve foot by ten foot building, including those used in the double doors, with a further two on each side. This means that only the back section of the sides, and the back itself, are made of the tough shiplap cladding. The result is very striking, and it’s very effective too if you want a summer house that’s particularly light and warm on a sunny day. With so much glazing we were very pleased to find that toughened safety glass had been used, which is virtually unbreakable under normal circumstances. A pent roof is at the summit, which reaches a high point of 2.17m. This isn’t the tallest pent roof we’ve seen on a large summer house, but we’re sure there’ll be more than enough room to move around in without having to bend down. We would have liked to see an initial pressure treatment used, and the extended warranty that would have gone along with it, but it was good to see that thicker cladding and tanalisation could both be added as optional extras for those who don’t mind paying a little more. 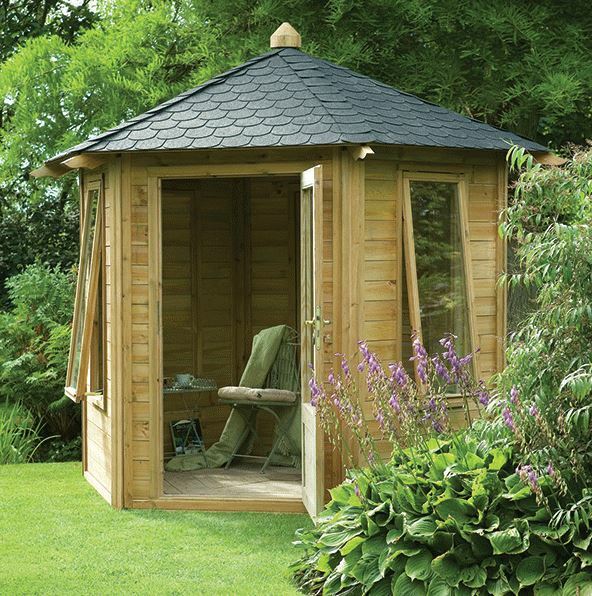 With this robust and large summer house having base dimensions of 4.88 x 3.05m, or approximately sixteen foot by ten foot, a home office is just one of the many uses that it can be put to. With its elegant facade, we can also see it making an ideal place to entertain guests or to stage dinner parties in as you look out at the garden. One reason that we were so taken with this TGB summer house’s looks is that it has two very large Georgian style windows, as well as a Georgian style half glazed door. It’s a design classic that should fit in perfectly with a traditional British garden. Once more, we would have liked to see an initial pressure treatment used, and a long warranty period applied. If this had been the case, then you could have expected to see this good looking and generously sized large summer house in the top half of our league table. One reason that we rate it so highly is that it features 16mm cladding, which is significantly thicker than the 12mm cladding that we ordinarily see on shiplap summer houses. This means the building will feel strong and robust when assembled, which adds value as well as peace of mind. 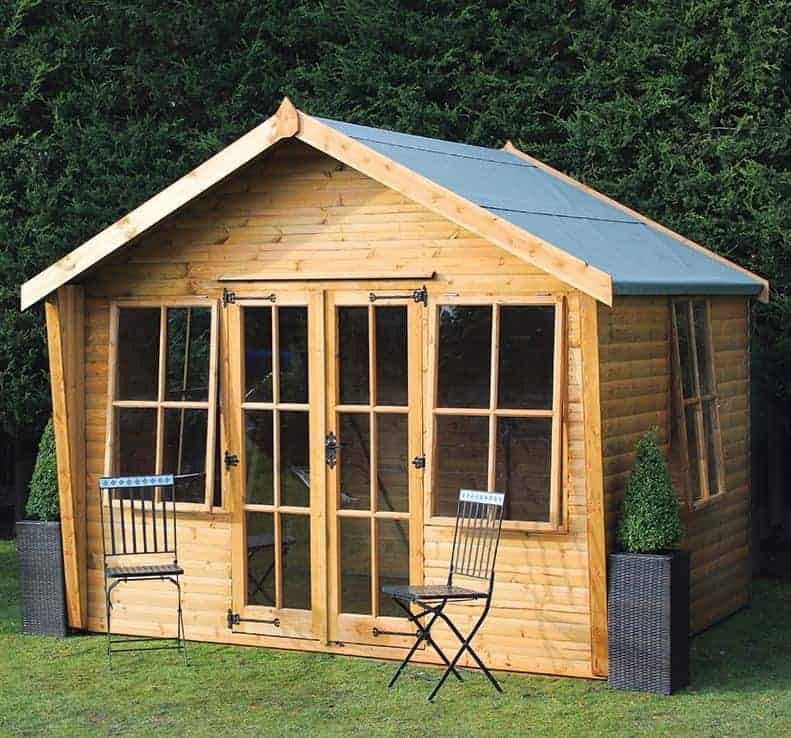 A traditionally styled large summer house such as this is sure to attract admiring glances from neighbours and friends, as it adds to the aesthetic appeal of the garden as a whole. That’s one reason why, even with an asking price of just over two and half thousand pounds, this could be a profitable investment if you plan on selling your home in the next few years. At fourteen by ten foot this is easily large enough to be used as extension to the house itself, and its height of 2.47m means that it wouldn’t ordinarily require planning permission – although of course it’s always wise to check this with your local authority. One thing that is unique about this large summer house compared to all the others in our league table is that it has a large overhang to the apex roof that forms a canopy, and a wooden veranda at the front. These are value adding features that we really liked, as they not only add to the already impressive looks, but create a sheltered area that’s ideal for a barbecue, or a space to relax in the shade on a sunny day. With Georgian style windows and doors as well, once more it’s only the lack of a long warranty period that sees this near the foot of our list. This large summer house is fit for a king, thanks not only to its traditional good looks but also to the 22mm thick shiplap cladding that has been used throughout. This is the thickest of all the cladding we’ve seen on timber, as opposed to loglap, summer houses and once it’s assembled you can feel the difference. 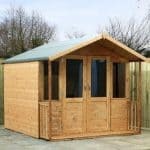 The enhanced strength and stability that this brings, especially alongside heavy duty framing as well, means that this should potentially prove to be a very durable addition to your garden. We would have liked to see this backed up by an initial pressure treatment, however, rather than the dip treatment used here. 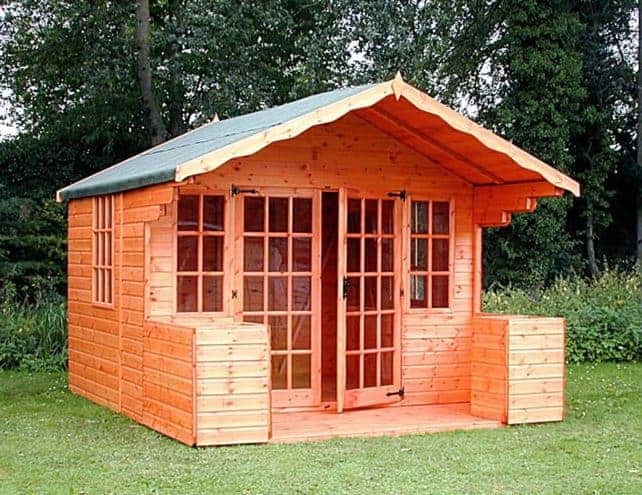 It means that the customer will have to treat the summer house with wood preserver themselves on an annual basis, which can be time consuming with a fourteen foot by ten foot building such as this. It’s for this reason that this otherwise excellent large summer house takes the final spot in our league table. One unique stylistic feature that we particularly liked is the inclusion of a bay window next to the Georgian glazed double doors. We also liked the ornate ironmongery on the doors, and the fact that a secure key operated lock is included as standard. If you want your large summer house to have an ornate yet traditional feel then this could be one for your shortlist.